The best way to enhance the Windows 10 speed is to cut down the overhead of what is running in the background without user attention. Squeeze every drop of performance out of your machine with the latest tips & tricks outlined here. If you are facing windows lagging and speed issues, then these simple and easy ways can help you to boost up your computer performance. Usually, I perform listed speed boosting ways whenever I face performance problems in my laptop. The ‘ReadyBoost’ feature in Windows 10 speeds up your PC by using your USB flash drive as a caching device. This is similar to adding extra RAM by just flushing up a memory device. This helps PCs with an insufficient amount of RAM. You now have the ‘AutoPlay’ dialog box on your screen. Click the ‘Speed up my system’ option. Click the ‘ReadyBoost’ tab in the new dialog that opens. Select the option named ‘Dedicate this device to ReadyBoost’ and then click OK. Temporary locations of your hard disk gather a substantial amount of data over time. This impacts system performance and gradually your computer starts lagging during normal activities such as; booting, loading applications, gaming and so on. Double click ‘This PC’ desktop icon. Right click the drive you want to clean. All drive information including the space consumed is displayed in the ‘Drive Properties’ dialog box. Click ‘Disk CleanUp’ button. Follow the on-screen instructions. How to Recover Data with Windows Data Recovery Software? Press Windows key + X; choose Run. Type ‘services.msc’ and click OK. It opens up a new window with a complete list of all services. Disable the services you don’t need. Right click, choose ‘Properties’. Set ‘Manual’ startup type and click OK. Maintenance to speed up Windows 10 is equally important to avoid lagging. If you love to play games, try optimizing computer services. There is one efficient tool, the Intel software partner, RegInOut System Utilities, which has an extreme gaming profile. It can be used to optimize services and play games in Windows 10 without any lag and speed issue. Browser junk consists of the user history, temporary internet files, downloaded items, cache and cookies. This junk can significantly affect your browsing experience and you may experience slow video buffering, browser errors and crashes. The best way to avoid lag while using the internet in Windows 10 is to clean up browsers junk manually or through some tool such as the RegInOut. This software also cleans the system files and makes your Windows 10 run faster. Keep in mind that Windows 10 is a light operating system that should easily run on your existing system running Windows 8.1 or Windows 7. However, you would need to keep your computer clean and optimized for robust computer operations. Right click on ‘This PC’ and go to properties. Choose ‘Advanced System Settings’ located on the left side. At the very first place in ‘Performance’ click on settings. Now choose the option ‘Adjust for best performance’ and click on apply. Microsoft Windows 10 computers have a brain! That is the Windows Registry – the central database that stores all the information about computer programs and services. This Registry plays a pivotal role in well-functioning of the system. If there are broken or missing Registry entries, you may experience errors, crashes and frequent lags in Windows 10. 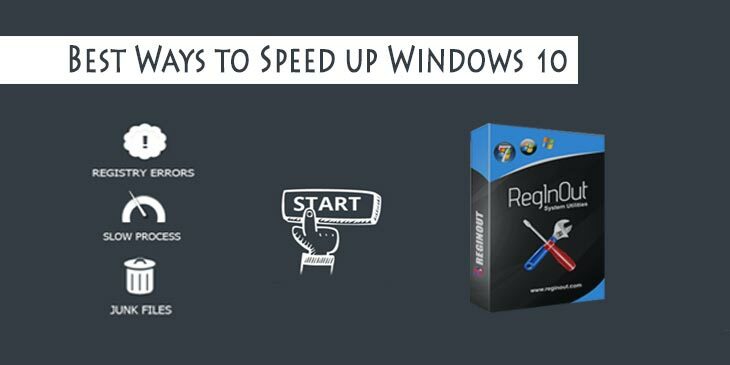 You can optimize Windows 10 registry using an efficient registry cleaner like RegInOut. How to Block Any Website in Windows 7 with Hosts File? Deleting duplicate files can also prevent lagging and may reduce windows 10 speed. The duplicates exist in every system and they must be removed to make data well-organized and more easily accessible. If you have lots clone data lurking inside your machine chances are that you will face low disk space issue and your computer would run slow. The best way to reduce such clutter is to use a duplicate file cleaner utility for Windows such as the Clone Files Checker. By uninstalling programs you no longer use, you free up the disk space and make your computer run faster. Open up the Control Panel. To do so, press Windows Key + X; choose ‘Programs and Features’. This opens up the list of all installed programs. One by one uninstall rarely used programs. Turn off some Windows features if you don’t use them. It depends entirely on you which features you would like to keep turned on or off. Press Windows Key + X; choose ‘Programs and Features’. Click ‘Turn Windows features on or off’ link. Now you will have a new dialog on your screen named ‘Windows Features’. Uncheck the features you don’t use. Click OK. So, these are some best ways that I commonly use to increase windows 10 speed in case of slowing PC performance and lagging. You can also try these speed-boosting tips to get the maximum performance of your computer. Would you like to share which steps you take for increasing Windows 10 speed whenever face slowing down performance and lagging issues?